What Day Of The Week Is September 13? 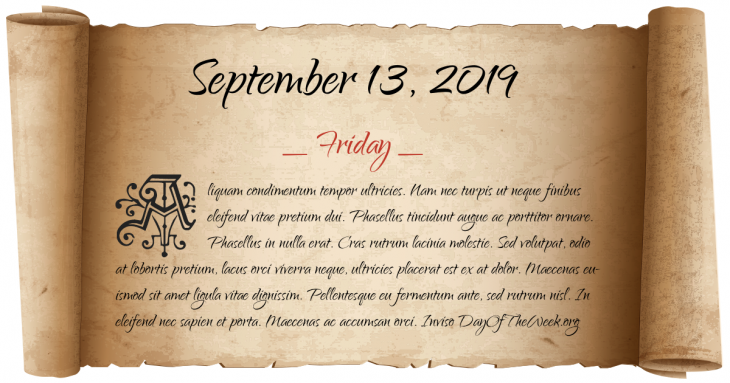 September 13, 2019 is the 256th day of the year 2019 in the Gregorian calendar. There are 109 days remaining until the end of the year. The day of the week is Friday. Great Britain, Austria and Savoy-Sardinia sign the Treaty of Worms. Mexican-American War: Six teenage military cadets known as Niños Héroes die defending Chapultepec Castle in the Battle of Chapultepec. American troops under General Winfield Scott capture Mexico City in the Mexican-American War. The temperature at 'Aziziya, Libya reaches a world record 57.8 °C. South Vietnamese Generals Lam Van Phat and Duong Van Duc fail in a coup attempt against General Nguyen Khanh. State police and National Guardsmen storm New York’s Attica Prison to end a prison revolt. Who were born on September 13?